With airlines getting less and less generous and more and more strict when it comes to baggage, along with some notable cases of airlines losing or breaking guitars, it can feel risky to travel with your acoustic guitar. But there are a few solutions that don’t mean investing hundreds of pounds in flightcases or sitting on a plane worrying about whether your guitar’s going to make it. Something like Yamaha’s Silent Guitar makes flying a breeze; the detachable top section of the body frame, together with the included gigbag - which is heavily padded and much smaller than a regular guitar case - mean it can be carried with ease, fitting into most aircraft overhead compartments with room to spare. Travelling on business for days or weeks at a time can be tough, especially being separated from your loved ones (*cough* guitars *cough*). Even if you do travel with a guitar, hotel stays usually mean limited luggage and noise curfews. There are lots of solutions for electric guitarists, but what if you lean towards the acoustic side of things? 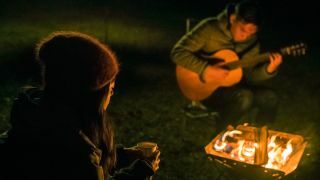 The Yamaha Silent Guitar offers a naturally quiet sound (around 80% quieter than a conventional acoustic) and is available in steel- and nylon-string versions. The SRT (Studio Response Technology)-powered pickup system gives natural in-the-room acoustic tone through headphones, studio-quality onboard effects and a line-in for easy jamming. It even features a line output, so you can record that 3am jetlagged masterpiece straight to your laptop or mobile device. The compact size of the new Yamaha CSF acoustic guitars makes them comfortable to play and easy to transport, while the new body and bracing design make sure these guitars pack a sound that’s rich, vibrant and full despite their compact size. They even come with a functional, durable hard bag - essential when you’re packing your guitar up with the rest of your outdoor gear. Find out more about Yamaha's travelling guitar range on the Yamaha website.